Melissa had another Vera Bradley sighting! Here is a girl at th SF conservatory of music waiting for the elevator. Even though the Summer prints have been out for a little bit Vera Bradley Signature Stores are having parties this week to help kick off the new prints. Some stores had their parties last night, like San Francisco and others are having their's tonight, like Sacramento and Glendale. I got an invitation to the San Francisco and Glendale parties and the invitations are so cute. The one for SF is in Night and Day and looks like a flip flop and it says that if you RSVPed in time you would get a free pair of flip flops. The one for Glendale was a postcard in the Call Me Coral colors and has a list of promotions going on all day. Today between 3pm-6pm you can get a Bucket Tote and a Taxi Wallet together for just $35! I think that my friend Amber was going to go take advantage of that offer. I wish I lived close enough to one to go participate in all the fun! So someone posted about a Mesh Flower collection on the Vera Bradley fan page on FB. Has anyone seen pictures? I really want to know what they look like! It sounds like they are in Loves Me! I love Loves Me! This is probably going to be tempting! San Francisco is the Signature Store that I have shopped at the most. I have a bunch of friends in the area, so I always make it a point to swing by the Bloomingdale’s Mall (that’s what we call it, it probably has a real name) to stop in a do a little shopping. This is the smallest of the 4 I have been to, but it is crammed with so much Vera! My first time I went to the SF Signature Store I went with my friend Melissa. I was going to pick up a Cargo Sling in Yellow Bird for my Mom. When we got there the woman was super nice and helped me find the bag. When I looked at it, it was huge! I sent my mom a picture of it so that she could see how big it was. I asked the woman if they had anything similar that would not be as big and she recommended on the On the Go. The On the Go was the perfect size, so that was what I ended up getting for my mom. She still uses that bag a lot. I don’t remember if I bought a bag for myself or not. I do know that I got the Hugs and Kisses Photo Album (what a cute name!) in Raspberry Fizz for myself and one in Yellow Bird for my mom. It was a special price if you were making a purchase. Oops, I just remembered that the Hugs and Kisses Photo Album isn’t on the list of all my items. I didn’t come across it when I was getting all of that stuff together, so make my total number 113. 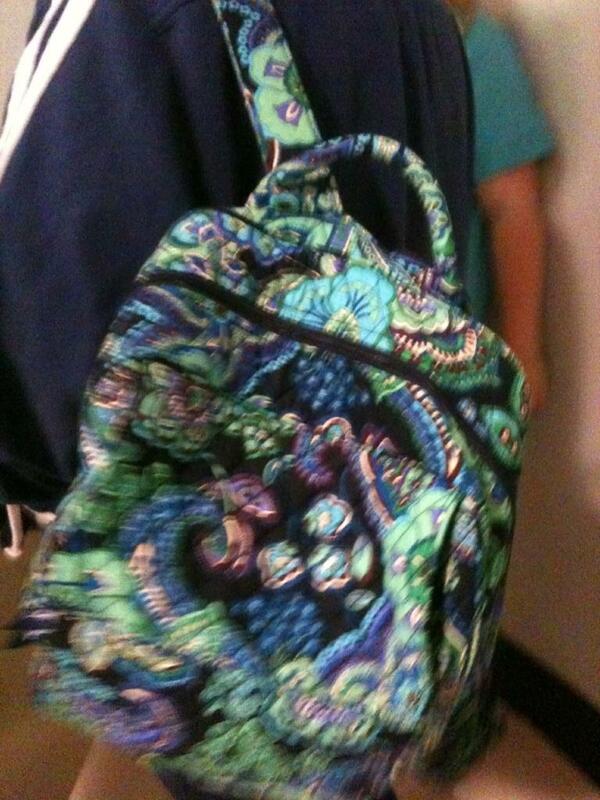 This was the day that Melissa finally came around and started liking Vera Bradley. Much like my sister, she was a little slow to like it. She bought her first pieces that day. But more on that later. I am still waiting for her to send me a picture and then I will write up about her and her Vera. The store in SF also has some of the nicest employees. Actually I have never come across a VB employee I didn’t like. They are all so friendly. That is what makes shopping at one so great! I have even called up there to order stuff and have it mailed to San Diego. Sometimes if they are running a special in store promotion I will call up to order. Lately I have been ordered from Glendale though, because I can get it the next day if I order it early enough in the day before FedEx Ground picks up. Haha, I can’t believe I know that. I have no clue and I am at work. Will try to figure it out when I get home. Hopefully it just fixes itself. What a bummer! If you ever go to a Vera Bradley Signature Store you might be lucky enough to get a water bottle. If you shop long enough, they will usually offer you one. I don’t know about you, but I work up a thirst shopping at a Signature Store. I can spend so much time in there! One time we asked for one, I forget who I was with, but I think that we asked at the Sacramento store. They are so cute! They always have them in the current colors. I have Daisy Daisy, Frankly Scarlet, Hope Garden, Symphony in Hue, Loves Me and Totally Turq. I don’t know why I have held on to them, they are just sitting on my counter taking up space. I still haven’t used the Daisy Daisy or Totally Turq. I think that it is time to let these bottles go. 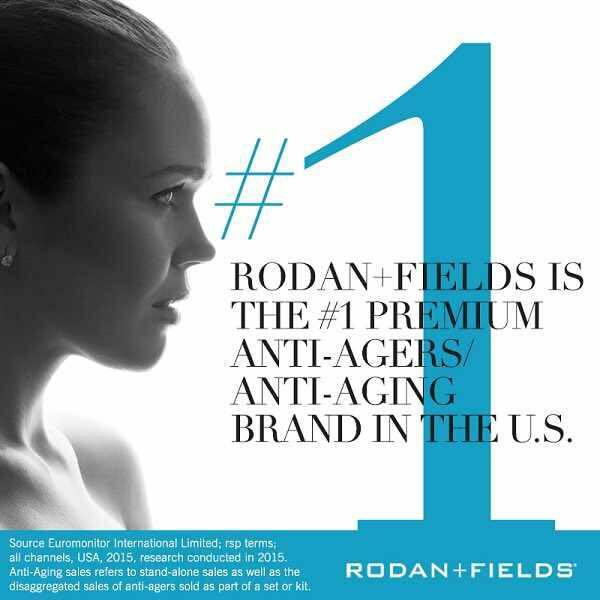 Make sure to pick one up next time you shop at a Signature Store! From now thru March 31st you can get 20% off all sale items. Amber's friend Melissa saw a Vera Bradley backpack in Blue Rhapsody at the Women's NCAA Baseball Tournament in Sacramento. Saw a Handbag in Ming at the Kings game but couldn't get a picture. Had to at least mention it isn't it is a pattern you don't see often. The Vera Bradley Foundation for Breast Cancer is raffling off a beautiful quilt as a fundraiser. I got an email about it this morning, but it isn't really clear how you can participate. It says for every $2 donation you will have an entry in the raffle, but I guess you have to do it in the stores. That doesn't make much sense, you would think that you would be able to participate online, but they don't have a link on either website to participate. 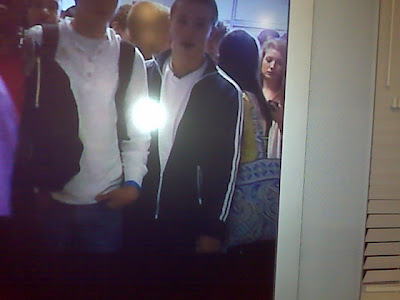 If anyone sees something about it online, please let me know. I don't think that I will have time to get to a signature store in time. I had a quilt donated to me last year for my Breast Cancer 3 Day Fundraising and it went really well. I made about $500 which was great because it helped my teammates reach their fundraising goals. If there was ever someone who I thought would never like Vera Bradley it was my sister. She looked at my mom and me like we were crazy for liking these bright, patterned bags. Well slowly but surely she came around. She isn’t a fanatic or anything, but she at least now sees the appeal. She even has a few of her own! Her first Vera was a Card Holder in Hope Garden that she bought on our trip to Hawaii last summer. The next item came when we were in Temecula visiting our cousin Katy. I knew there was a store up there that sold Vera Bradley so we took Katy with us to check it out. We spent way too much time is this great country store called The Farmer's Wife and Erin came home with a Notable Mousepad in Hope Garden. Katy even picked up a couple Vera Bradley items, I believe a Nylon small cosmetic bag and the Black Microfiber Zip Ar0und Wallet. For Christmas I gave Erin a itunes giftcard and decided it would be fun to put in a Zip ID Case, so I got her one in Hope Garden. For her birthday I couldn’t decide what to get her, but I had a feeling that she would like Sitting in a Tree. I decided to get her the All in One Wristlet. She opened it and she didn’t hate it, but I could tell she was a little hesitant. I thought maybe I had gone too far, maybe four Vera Bradley items was too many. I told her that she could return it or exchange it and I wouldn’t be offended. I knew I had taken a risk. She said no, that she thought that it would work for something and that she would keep it. She works across the way from the store that I bought it at and on a break she wandered in there to check out what else they had and came across the Flapper Wristlet in Sitting in a Tree and decided to exchange for it. I was excited when I found out that she exchanged the one I got her for the Flapper Wristlet. The Flapper Wristlet wasn’t out when I bought her present, but I had seen online and knew it was super cute! And she is really happy with it, which makes me happy. The one thing we realized that all of Erin’s Veras have in common, is that they aren’t quilted! Vera Bradley quilts almost all of their items and Erin’s collection is strictly non-quilted. There are only a couple of other items I can think of that aren’t quilted like the Quickstep Wallet and the Ditty Bag, but I think that I will wait a while until I try to buy her any more Vera. We have come a long way since the summer! I am so glad all the girls in the fam like Vera! I guess it is full disclosure week here at OhMyVera! I can’t throw away my Vera Bradley Shopping bags! I think they are great, especially the purple punch shopping bag. I really wanted one of the Symphony in Hue shopping bags, but ended up buying just a Saddle Up so I got the smaller yellow bag. I feel like it is okay to keep the shopping bags. I really don’t have that many, plus they are flat and fit in my hall closet. Look how small the blue one is! I can’t believe I bought something that fit in there! Must have been a LONG time ago, because I don’t recall what I would have purchased that was that small or that I had the restraint to only buy something that small. The new colors are online! The new colors are Night and Day, Make Me Blush, Call Me Coral and Simply Violet. The new styles are the Large Hobo, Knot Just a Clutch, Trip Kit and Have a Ball Keychain. Happy shopping! I am going to sit out this round. In addition to all the bags and accessories I was also keeping the boxes that they came in if they were mailed to me. I didn’t realize I had so many. I went to put these away and found two more under my bed. So I decided that instead of ending up like a hoarder it was time to let them go. I decided to keep 4 of the boxes to use to store some of the bags and accessories, but the rest of the boxes need to be recycled because they were just taking up space. Right now they are sitting in the hall, but tonight, they go in the recycling! So I did it! I counted every piece of Vera Bradley that I own. I pulled it out of my closet, drawers and shelves. There was something in every room in the house! Even a shopping tote in the car that I decided to just leave there because I didn’t want to go back outside. My guess for how much Vera I owed was in the 70’s, well I guess I underestimated a little bit. The final number came to 112! This includes the free water bottles they give you at the signature stores (6 of them). I have everything from mints to totes and PJ shorts to wristlets. I even made an excel spreadsheet of everything I own with the name of the bag or item, its color and how many of then I own. A few things didn’t make it into the picture, like the shopper tote that was in the car, the water bottles, a thing of mints in my desk at work and two ribbon boards that I didn’t feel like taking off the wall. Some of it was a gift with purchase, some were gifts and most of them were on sale. I think that I probably have enough Vera to last me a while. I am always tempted to buy new bags, but I think that since I am not that excited about the summer colors anyways so it will be easy to wait a while. I am going to get that yoga mat though! Update: I mailed Beth a mini notebook, so that is one less Vera! Yay. Except that I found the Vera Bradley Mug that Amber gave me in my kitchen, so back to 112. Alright, just got home from spin class and I have decided that tonight I will count all my Vera. I am guessing that I have a medium amount of stuff. I will take a picture and post the final number tomorrow. Anyone want to make a guess about how many pieces I have? I was watching Kirstie Alley's Big Life and saw that she has an Imperial Toile cosmetic bag!!! This picture is from Melissa. She is out shopping at the Sonoma Country Store in San Francisco with her sister Valerie. 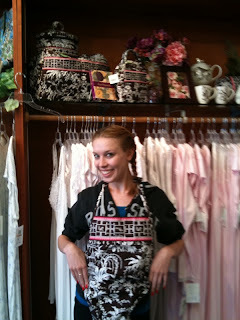 Val is modeling the apron in Imperial Toile. Cute picture! Thanks ladies! Here is another picture from Melissa and Val at the same store, this one is of Melissa. Well, I never imagined I would say this, but maybe I have enough Vera. (Gasp) Since I started writing the blog I have been taking pictures of my bags to post, so I have been going though all my Vera and it made me finally think that maybe that I don't need any new Vera for a while. I have never counted all of my Vera because I didn’t want to know how much I really had, but maybe it is time. I know that my collection is probably small compared to some people’s, but everyone has a point when they have more than they can use. I have always tried to buy new bags and new colors to not have too many duplicates. I think the only items I have multiples of are the Tote, Gabby, Ditty Bag, Zip ID case and Zip Sunglass Case and by multiples I mean two in different colors. Maybe if I have enough time this afternoon I will try to lay it all out to count and take a picture. I also keep the tags for all my stuff, I could count those real quick probably. I can’t believe this day has come. PS. Even though I say I don't think that I am going to get anything for a while, I think that I am going to get the Yoga Mat when it comes out. Does anyone have any idea how much they are going to charge for it? Like I mentioned yesterday Vera Bradley always have a pattern out that they giave 10% of the proceeds to their Vera Bradley Foundation for Breast Cancer. The current pattern is Loves Me. The colors are always so fun and bright. I have Loves Me, Hope Garden, Pinwheel Pink and Pink Elephants. I’ve decided to make it Breast Cancer Awareness Weekend here at OhMyVera! As my friends and family know I signed up to walk in the Breast Cancer 3 Day Walk again this year! Last year was my first time participating and it was such an amazing experience! Vera Bradley has the Vera Bradley Foundation for Breast Cancer. They always have a print out that they give 10% of the proceeds to their foundation. I will post more about that this weekend. The picture is of me and my Mom at the end of the Breast Cancer 3 Day walk. You will see that I have my Vera Bradley Pink Cupcakes lanyard on! VB is always with me! This week I kicked off my fundraising. If you would like to make a donation to Susan G. Komen to help me reach my fund raising goal, you can click here to visit my fundraising page. I have to raise at lease $2,300 to be able to participate. I really appreciate your support! So I tried to scan in my postcard but had technical difficulties, so I had to take a picture of it. Get excited because Summer 2010 are coming out soon! Their official release date is March 22nd, but I bet you can find them sooner if you wanted to. The new colors are Call Me Coral, Make Me Blush (a pastel version of Poppy Fields) Night and Day and Simply Violet. There are also new styles coming out and two of the new styles are a Hobo bag and a travel case. The Hobo bag is the bag on the top of the stack in on the postcard and it looks pretty big! The new colors look really pretty, but none of them really stand out to me or make me want to go buy them next week, which is actually a good thing, because I don’t know how much more Vera my bank account can handle. I think that I will have to get something in Night and Day though, because it will be nice to have a black and white bag. One thing that I have heard about VB bags with a lot of white on them like Mediterranean White and Hope Garden is that they put something like Scotch Guard on there to help keep them looking nice and clean. Another thing that I am really looking forward to is a yoga mat! I know they will be in the spring colors and I really want one in Loves Me. I think that they are coming out around the same time, but I am not 100% sure. Thursday you can get a Vera Bradley Small Duffel in a retiring color for just $30. I think that they are too small when I want to tote stuff around, so I have never bought one. I was tempted once, but I dont think that I could fit my stuff in one. Maybe someday I will add one to my collection. PS. I heard Pleated Totes are going to be the special on Friday, only $35. Plus you can use code save20sale and save 20%. Vera Bradley has Hipsters in retiring colors on sale today only for $19! Some colors are already sold out. What a great deal! Thanks Nicki for the heads up! Click here to go to the Hipster bag. I am so excited my new Vera Bradley stuff arrived today! I got such a good deal on it, so Mom, don’t worry that I am spending too much! First off everything was 25% off. Then I had a coupon for $25 off any purchase over $100. And lastly I was able to get the Quickstep Wallet for $15, which was what put me over the $100. I am so excited because I have always wanted placemats. Cupcakes Green goes with my blue plates, so I had been waiting for them to go on sale. The wallets that I have are the smaller ones like the taxi wallet, which I don’t think make good everyday wallets, so I am excited to have a Vera Bradley wallet that I can use all the time. Horrible picture but trust me, it is a VB in Medallion. Hard to drive and take pictures. Don't worry Mom, I'm driving safe! Most of my friends thought that my Vera bags were a little crazy or bold when they saw me carrying them. But some of them have had a change of heart and even carry them now! Amber was with me when we visited the signature store in Hawaii and even though she didn’t buy anything it caught her eye. She had mentioned that she liked the Puccini print, so for her birthday I bought her a Curling Iron Cover in that print. By the way, Curling Iron Covers make great gifts. Well it only took one and Amber was hooked. Her first purchase she made herself was Zip ID Case in Night Owl. 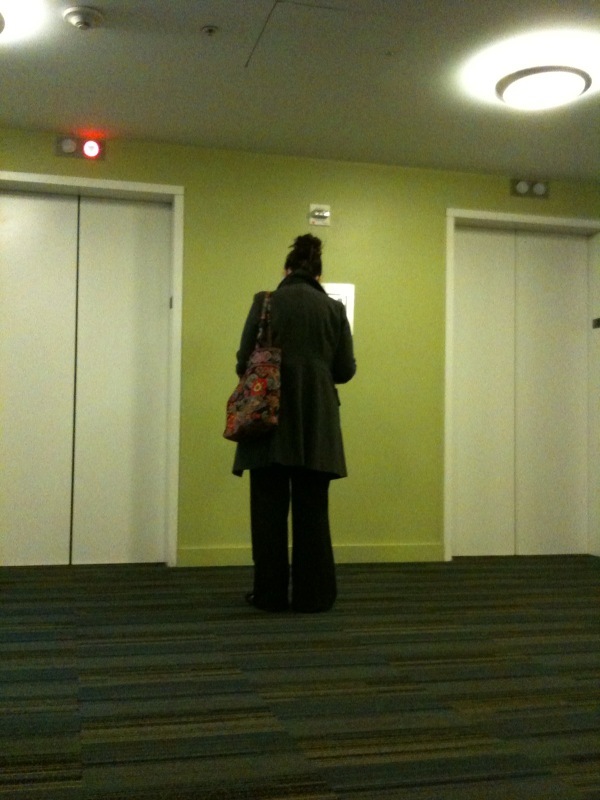 Since then she has purchased a Zip ID Case and Laptop Portfolio in Pirouette. About a month ago Amber called because she had just signed up to sell Pampered Chef and she was looking for a VB apron to wear to her parties. We had seen them at the Sacramento signature store back in December. I happened to be on my way from the LA Kings hockey game to the signature store in Glendale. So I told her I would see if they had any there. In the mean time I called a couple of stores in San Diego that I have purchased VB from and she called ALL the stores in Sacramento to see if they had one. No one had any aprons. When I got to the signature store in Glendale they said that they had been out since they had put them on clearance in December. They will come out with aprons again for Mother’s Day. Amber couldn’t wait that long, but was able to find one on ebay. Amber was just at the Sacramento signature store about a week ago and picked up a couple more VB items. She took her coworker Melissa with her. Melissa had never been before and she ended up buying a Curling Iron Cover. (See I told you it was a good first item!) The woman at the store even gave them each a free Card Holder since Amber recruited a new VB fan! Vera Bradley sighting in Pacific Beach, maybe. Could be an imposter, I haven't seen this print before, but it is the Betsy style. Will check it out when I get home. Update: Ahh, darn it, I was fooled! I looked up the print and I can’t find it on the VB website. Guess that’s what I get for looking for VB sightings after champagne brunch. I love the story about how Vera Bradley got started. I hope that I don’t get in trouble for copy and pasting it from their website! Nicki emailed me this picture, look at all that Vera!!! I wish my closet looked like this! There are so many good deals right now! You already know that Cupcakes Pink and Cupcakes Green are on sale. They will be on sale online until they run out and in stores until March 17th. I have always wanted to buy placemats, so I think that I am finally going to get some in Cupcakes Green! Right now you can get free shipping on all online orders over $75 until March 17th. Next week in stores they will be offering Patchwork Quickstep Wallet. It is $15 with any purchase and will be available from March 15th to March 29th. It will be in all 4 of the spring colors. I am going to get one in Poppy Fields! I am such a sucker for a gift with purchase! Once I started buying Vera on ebay I realized that there is a pretty big market for reselling it. At first I couldn’t imagine selling any of my bags! I also started looking on craigslist, but in San Diego there are never very many listed. One time I was lucky enough to find a Cupcakes Pink Villager for $5! I was shocked. That bag retails for $72. I emailed them right away and was able to purchase it. It was quite an adventure picking it up. It was in a rough part of town that I had never been too. The way that I knew for sure it was bad part of town was that there was a pit bull in the front yard. Nothing says welcome like a pit bull. The bag is just like new. She maybe used it a couple of times. The Villager is not really my style so I decided to list it on ebay to see how much I could make. It sold for $33! Pretty good deal! So I decided to keep looking to see if I could find any other great deals. I was feeling pretty limited by the listings in San Diego and I have a few really good friends in San Francisco so I decided to look on the craigslist up there. Well sure enough I found a Piccadilly Plum Large Duffel in like new condition for $20. I knew there was a high demand for Piccadilly Plum so I asked my friend Melissa to pick it up for me. On her lunch break she had to go across town to pick it up, what a trooper! I went up to visit SF later that month and picked up the bag. When I got home I listed it on ebay immediately and it sold for $61! Those are the only bags I have purchased off of craigslist, but I still keep a look out for good deals. Although now I just look in San Diego, so that I am not tempted to send Melissa on a lunchtime adventure to pick up bags for me. One other thing that I like besides Vera Bradley is scrapbooking! When I was scrapbooking my trip to Vera Bradley I couldn’t find any paper to go with the page, so I tried to recreate Raspberry Fizz myself. It isn’t a perfect match, but it was fun to do! Plus we took pictures of the water bottles they gave us! Cupcakes Pink and Cupcakes Green Go on Sale Tomorrow! Just read online that Cupcakes Pink and Cupcakes Green will go on sale tomorrow! 25% off everything in those colors! 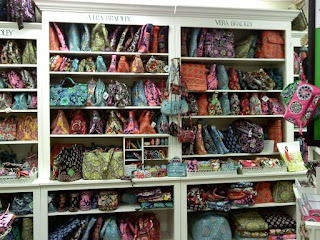 There is nothing like shopping at a Vera Bradley Signature Store! 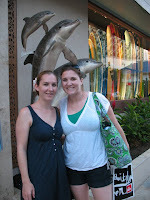 In July of 2008 I went to Hawaii for my friend Sophia’s wedding. I knew that there was a Vera Bradley signature store in Honolulu so I asked my friends if they would mind going there. My friends knew I loved Vera, so they were up for visiting the store. They didn’t know what they were in for, I didn’t either for that matter. We walked in and the whole store in floor to ceiling Vera Bradley! I was so excited! I don’t know if my friends had ever seen me so excited before! They started asking questions about bags and I was rattling off answers as fast as I could. One of the employees came over to see if we had any questions. The funny part was that I was able to answer some of my friend’s questions better than she could. I knew that I wanted to buy a bag, because the sales tax is Hawaii is lower than in California and I love to save a buck. I picked out a Morgan in Raspberry Fizz. We probably looked at all the bags in the store. I was almost ready to check out when I spotted Raspberry pajama shorts on sale in Raspberry Fizz! I had to get them, they matched my bag! 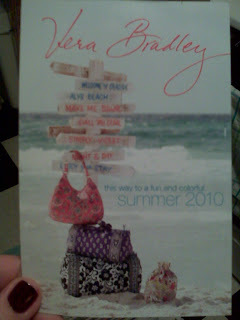 Vera Bradley was giving out a gift with purchase! Yay! I got a mini traveler key chain in Raspberry Fizz. The woman at the store had so much fun with me and my friends that she gave them each a key chain too! So Amber, Alicia, Beth and Kristine all got a souvenir from their first Vera Bradley Signature store. There was one more surprise. I had read online that the stores would once and a while give out water bottles with the print of current patterns on them. Well, I had just finished checking out and the woman at the store told us to hold on for a minute. When she returned she had 5 water bottle for us! They are just mini water bottles, but they are so fun. They deserve their own post, so be on the look out for that. Shopping at a Vera Bradley Signature is one of my favorite things! They are fun! I love the patterns and colors! They are made out of cotton, so they are super light. Load them up with as much stuff as you want and I bet they are lighter than any other bag you use. They have so many pockets! Each bag has about 3 slip in pockets on the inside along with a zipper pocket. Some have more or less, but the point is, there is a place for all of your stuff. Everything is nice and organized. They aren’t expensive compared to designer bags. Almost all of the bags are under $100! Most range from $30 to $80. There is something for everyone. There are so many styles and colors to pick from. Even my friends who at first said that Vera Bradley wasn’t for them have been able to find at least one color or style that they really like. Here is a picture of my Alice purse in Loves Me. It is a new color and style for the spring. It has 7 slip in pockets and a zipper pocket. Love it! 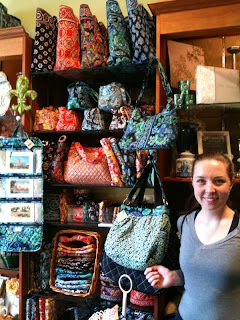 Beth in San Fran found some Vera! 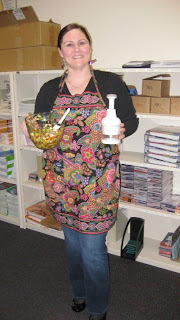 Way to go Beth, you made the blog! Thanks Melissa for the picture! Vera Bradley in Purple Punch. I was watching the news this morning and the girl in the yellow has a Purple Punch bag, but all I can see is the strap. Last week Vera Bradley came out with their new patchwork bags and I was so excited! I have been waiting for the Charleston Tote since someone posted a picture of it online from the spring look book. 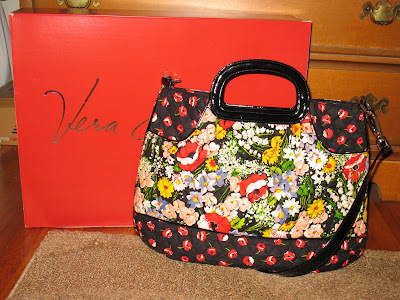 So I called the Vera Bradley Signature Store in Glendale on Wednesday and by Friday I had my new tote! In the past Vera Bradley has combined the different patterns that were released that season all together to create their patchwork. I haven’t been too fond of them because the patterns don't always go that well together. Plus people already tell me my bags are crazy and colorful, well just imagine 4 patterns all mashed together. Well this season they got it right! They combined the main outside print with the coordinating pattern that lines the inside of the bag! The combination is amazing! They always have a great coordinating pattern on the inside and now it is on display for everyone to see. I bought the Charleston Tote in Poppy fields and I am totally in love with it! Tonight at softball Nick said if I hit a homerun that he would get me a Vera, so I told him that if he hit a homerun I would get him a Vera. Game on! Well, neither of us hit a homerun, so no Vera today. And to top it off, we lost the game. Maybe we would have had a chance if we hit those homeruns. Here’s hoping for a win next week! Vera Bradley, Purple Punch, On The Go purse sighting at PETCO Park! As I said before Pansies are Tri Delta’s flower. Every once and a while I would look on eBay for Tri Delta stuff or for stuff related to our symbols. I would search for pansy stuff in particular and I would come across Vera Bradley Pink Pansy purses. One day I decided to bid on one and from there it snowballed. I bought a Little Betsy, Bitty Betsy, Tote, XL Duffle, Garment Bag, Coin Purse, Wristlet and Jewelry Case. And then I bought my sister Erin a Bitty Betsy, which somehow ended up in a garage sale box. I reclaimed the purse, hopefully someday I will have a daughter or niece and she can use it! How cute will we be with our matching purses?! Pink Pansy is the perfect pattern for me! It is pink, which I love and it has pansies, which I love! Pink Pansy retired before I started buying Vera Bradley stuff, so all of my items came from eBay. I wish I had started buying the pattern before it retired, although I can’t imagine how many pieces I would have if that were the case! Vera Bradley also make the same pattern with the pansies, but in yellow and blue instead of pink and it was called Katherine. I also bought a Little Betsy in that pattern, but lets face it. I am pale and have a hard time pulling off yellow. My Mom’s birthday was around the corner and the standard response to what do you want for your birthday was not a nice card and to spend time with her daughters, it was a Vera Bradley bag. You mean those bags from convention?! My mom loves blue, so she had her eyes on a Bermuda Blue Villager. They zip closed and would be good for carrying her lunch, purse and nurse stuff. So I found myself at Mary’s Secret Garden when it was in Poway. All I knew was that I was supposed to pick up one of those crazy colorful bags for my Mom and since she never really asked for anything that it was my mission to get one. I walked into the store and a woman who worked there greeted me. She asked me if she can help me find something in particular. I told her that I was looking for a Vera Bradley Villager in a blue/aqua color. She walked me over to where they keep the Vera Bradley bags. Wow! I have never seen anything like this! There are shelves covered in bright colorful bags. There are soooo many to choose from. I could have never found the bag I was looking for without the woman’s help. But they are out of the Villager! Oh no, what is a girl to do? Well, thank goodness the woman I was speaking with seemed to know everything there was to know about these bags. She recommended a Vera tote because it was a little larger than the Villager and would hold all of the things that my mom wanted to carry. She even showed me how the bag could be flipped inside out. Wow, who knew these bags were so fun?! So then I started looking around and I come across an accessory that seems to fit in my budget. It was a Curling Iron Cover in Sherbet. I have never needed to cover on my hot curling iron before, but all of a sudden I just feel the need to own a piece of Vera myself. I decided to buy the Vera in Bermuda Blue for my mom along with a Double Eyeglass Case. And finally my very own Curling Iron Cover in Sherbet! My first Vera!